After a couple of week’s spent driving the Hyundai Kona EV & the Hyundai i30 Fastback 1.4 petrol, it was refreshing to climb back into a diesel, not least because the fuel tank doesn’t run dry after 200 or 300 miles. 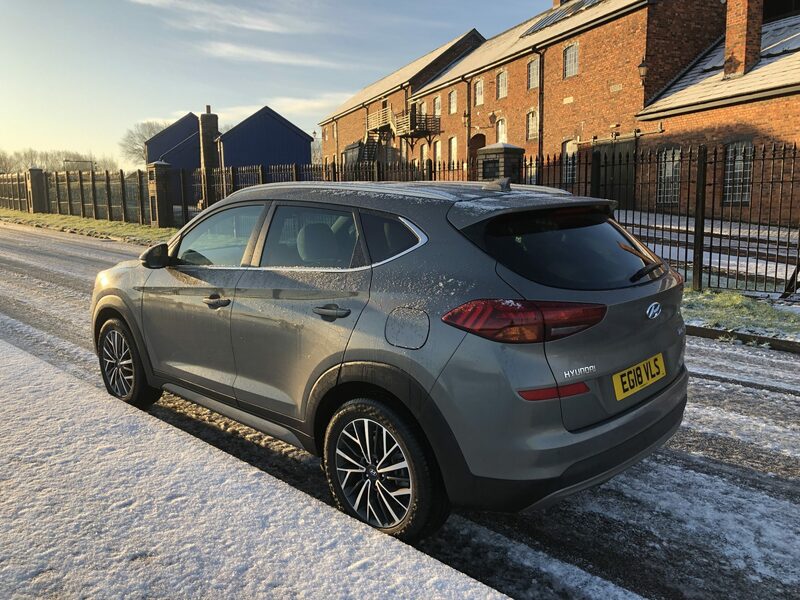 Hyundai delivered their updated Tucson to Company Car & Van in mid-January, the Tucson Premium 2.0CRDi 185PS 4WD 48v 8 speed automatic, which retails at £32,945. 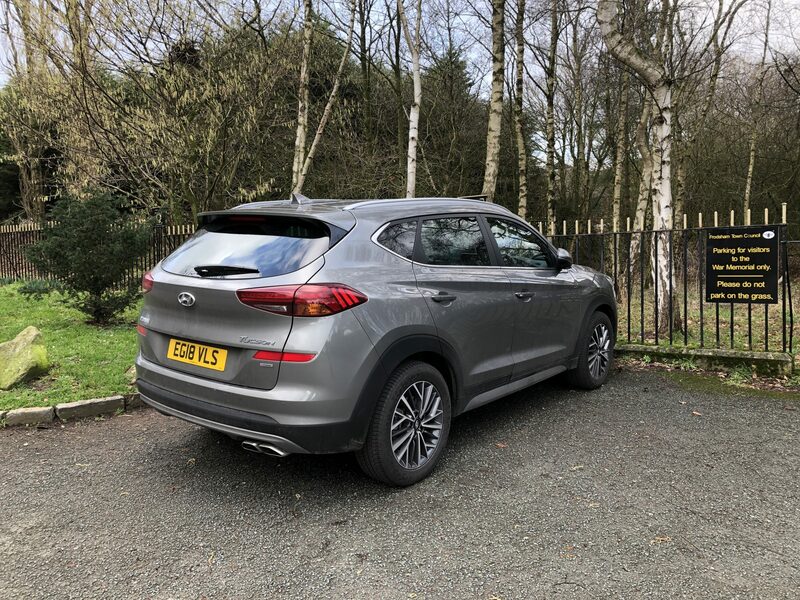 For the first time in a Hyundai, this version of the Tucson features a 48v mild hybrid powertrain, similar to the one available on sister model from Kia, the Sportage. The technology designed for electrification comprises a 0.44 kW/h 48-volt lithium-ion battery, a Mild Hybrid Starter Generator (MHSG), a LDC converter (Low Voltage DC/DC) & an inverter. With this technology, Hyundai aims to reduce fuel consumption & CO2 emissions by up to 7% combined with the manual transmission in NEDC conversion. The 2.0 diesel engine is the most powerful in the New Tucson’s powertrain line-up offering an output of 137 kW/186 PS. It comes with 4WD & is paired with the newly developed 8-speed automatic transmission. Later in 2019, the 48v mild hybrid technology will be available with the new Smart Stream 1.6-litre diesel engine in the Tucson. The Tucson range has been revamped for 2019. We always felt that the Tucson’s one of the best looking crossovers out there & the changes don’t alter this . Changes include full LED headlights & a ‘cascading grille’ at the front, whilst inside, tech has been improved, with all models now offering Apple CarPlay & Android Auto. The 2.0 CRDI that we tested, offers 185PS & 400Nm torque & comes with an 8-speed torque converter auto. The new Smart Stream 1.6 diesel, will be available with either 115PS/280Nm or 136PS/320Nm. Both versions will be offered with a 6-speed manual transmission, with front wheel drive. The more powerful version twill also be offered with 4WD. Whilst the 2.0 litre mild-hybrid we tested, drives well, with a 0-62mph time of 9.5 seconds, the caveat with 4WD coupled to the auto box, is highish CO2 emissions, of 151g/km, meaning your first year of VED will hurt. Having said that, the combined claimed fuel economy is actually a decent 49.6mpg on the combined cycle, which for a car in this sector, is pretty good. It’s actually difficult to tell when you’re driving this Tucson, what the 48v system actually does. In reality, it works when you slow down or get going again, cutting the engine slightly early as you come to a halt, whilst offering electric power when you accelerate away again, although it’s all done so smoothly it’ shard to notice it. The Tucson Premium comes very well equipped, with 18″ alloys, silver roof rails, a chrome effect grille, silver front & rear skid plates, Blind Spot Detection System (BSD), Rear Cross Traffic Alert (RCTA), an 8″ touchscreen, wireless smartphone charging, KRELL premium audio , with 8 speaker’s plus subwoofer, Smart Key keyless entry with engine Start/Stop Button, auto hold function, heated front seats, part leather seats, front & rear parking sensors with rear view camera, cruise control & a towing assist function. 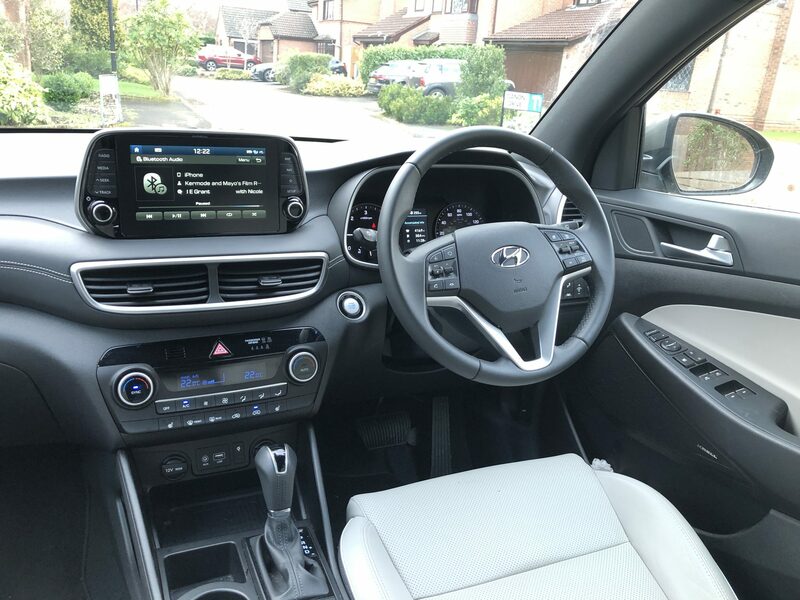 Customers buy SUV;s for their space & inside the Tucson, storage is generous, with a glove box, decent door pockets with room for a drink in each, twin drinks holders between the front seats, an armrest with underneath storage, a USB, Aux in & 12V connection above & a small cubby hole next to the gear lever where you can keep your keys. Rear passengers benefit from a pull out centre armrest with two drinks holders in it, twin air vents & a USB connection. The battery in the hybrid version & the 4WD, do combine to lose you boot space. 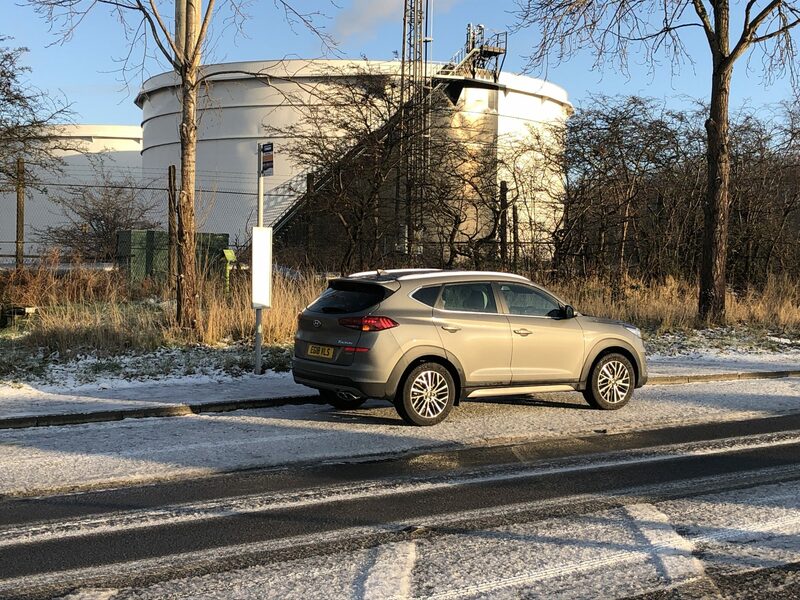 The standard 2WD Tucson comes with 513 litres of storage, whilst the hybrid 4WD we drove, offers only 459 litres, though this will still be enough for many. Out & about, the Tucson handles like most uprights SUV’s, tackling corners & winding roads adequately. Ultimately, in 4WD guise, this is a heavy car, weighing in at 1634kg & this means that it’s always going to drive best, in either a straight line, or on the motorway, where it’s an excellent performer. Set the cruise control & off you go. On our pot-holed UK roads, the large ground clearance coupled with the decent suspension, allow the Tucson to tackle poor roads with ease. Both front seats offer numerous adjustments, so getting comfortable is easy as well. 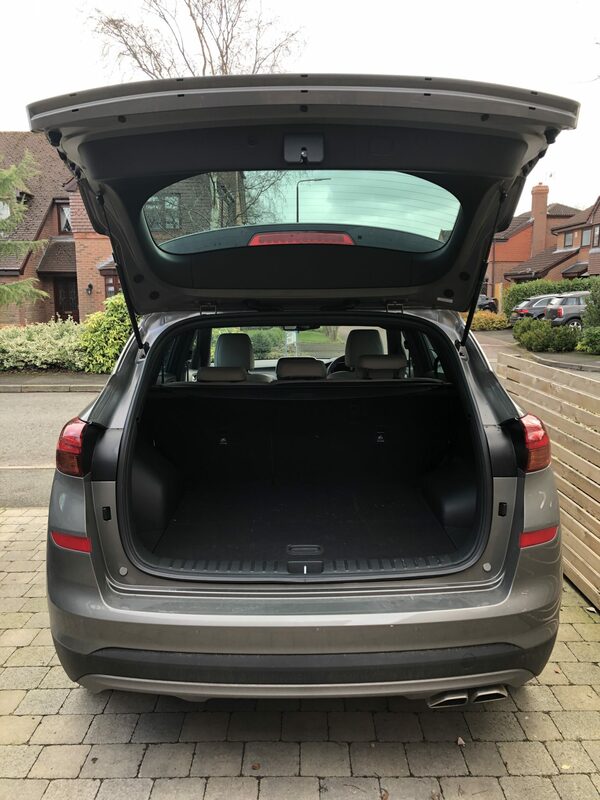 In the rear, there’s excellent head & legroom, even in the centre most seat, although in common with many other vehicles, it’s slightly raised & a little unforgiving on your rear. 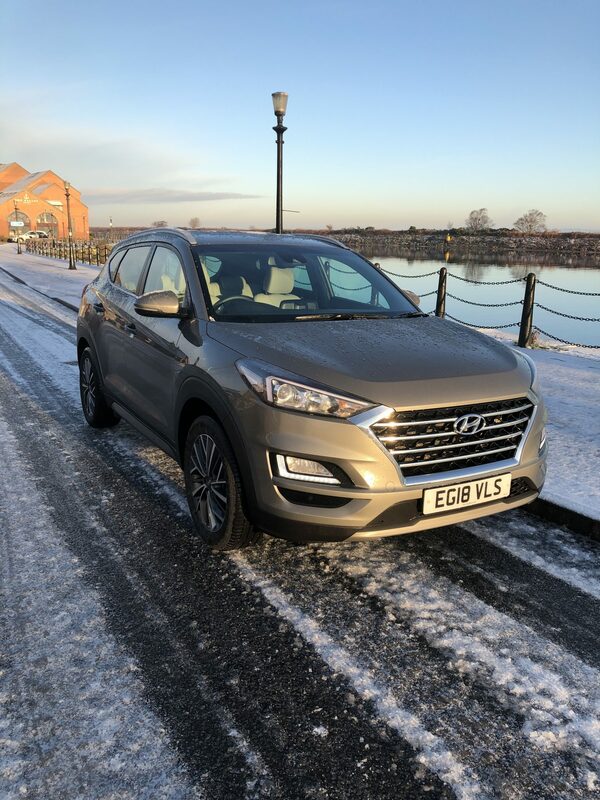 January offered up some typically incremental weather, with snow & ice in the North West, where the Tucson in 2WD, handled some very icy side roads with aplomb. Indeed, the Tucson felt incredibly capable in all situations we encountered including torrential rain. The infotainment system is straightforward to use, with the Apple CarPlay & Bluetooth handsfree phone connection’s simple to negotiate. At motorway speeds, you can make & receive handsfree calls without resorting to shouting & the cabin is well insulated from outside noise. We spent around 70% of our week with the Tucson, driving on the motorway & our combined fuel economy was a respectable 38.4mpg. Bearing in mind that our test car featured both 4WD & a battery, this figure is actually pretty impressive, with the Tucson actually outperforming the 2WD versions of the Mazda CX- 5, Toyota Rav4 & KIA Sportage we drove last year, by around 4mpg. 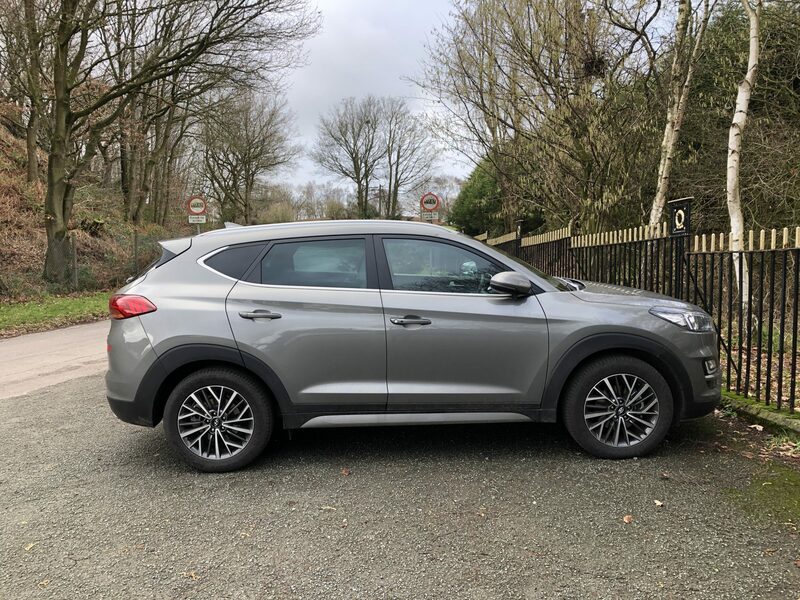 Whilst the updated Tucson from the outside anyway, doesn’t look that different to it’s predecessor, the addition of the hybrid version, especially when it arrives on the 1.6 diesel version, makes an interesting alternative to what’s available in this sector. The build quality across the Tucson range has also improved & it’s all put together in the typically excellent Korean way. Like all Hyundai’s, the Tucson comes with peace of mind, which is a 5 year unlimited mileage warranty, including 5 years road side assistance & 5 years of annual vehicle health checks. I really liked the diesel version & much prefer the diesel version to it’s petrol sibling & would choose the diesel every single time. Diesels not dead & this Euro6 Tucson is just further proof.